Dreaming of getting married in sunny Florida or on a tropical island? If you are looking for an intimate way to say I do with your closest family and friends by your side, then a destination wedding is your best bet. Fantaisie Events will help you every step of the way and you can rest assured your day will be a breath of fresh air. Pack up your bags and let us handle all the rest. We provide luxury included Wedding Packages to all of the Sandals, Beaches, Grand Pineapple Beach Resorts throughout the Caribbean. 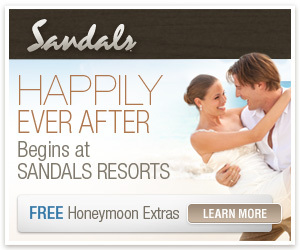 Destination planning for weddings, honeymoons, birthdays and all other celebrations! Get started on your honeymoon plans now. 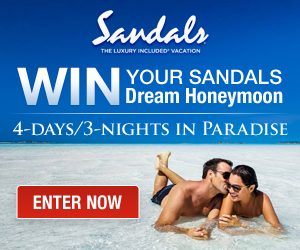 Just click the Sandals links below to get started on your Fantasy Honeymoon or Destination Wedding at one of the many Sandals, Beaches or Grand Pineapple Beach Resorts in Jamaica, Antigua, St. Lucia, Turks & Caicos, Bahamas, Grenada and Barbados.